Location: Armadale, Skye, Highlands, Scotland. Ownership / Access: Clan Donald Centre. Notes: Armadale Castle is a ruined country house in Armadale, Skye, former home of the MacDonalds. A mansion house was first built here around 1790. 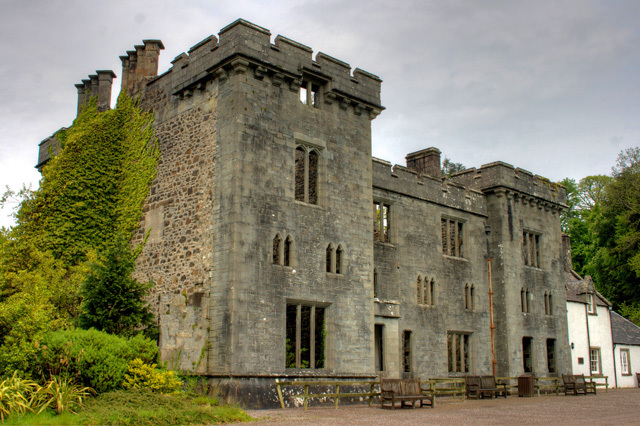 In 1815 a Scottish baronial style mock-castle, intended for show rather than defense, designed by James Gillespie Graham, was built next to the house. After 1855 the part of the house destroyed by fire was replaced by a central wing, designed by David Bryce. Since 1925 the castle, abandoned by the Macdonald family, has fallen into ruin. The gardens around the castle have been maintained, and are now home to the Clan Donald Centre, which operates the Museum of the Isles.